Over the last two weeks John and I have built and failed 10 or so short tank samples. Now we have to put together the tooling to make flight length tanks , ie longer than the samples. I did a 3d printed regen motor design and sent off to have a SLS nylon version printed to evaluate. That should be here today. Pretty neat! Is the mass ratio with peroxide or with both propellants at the intended mixture ratio? Was nylon model the same size? Is it possible to design the chamber so channels could be (better) cleaned after manufacturing? 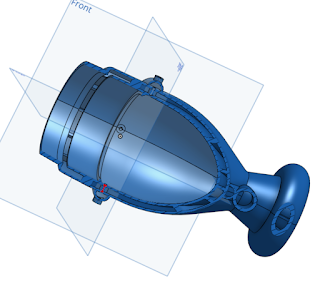 That will de-optimize chamber, but still - manufacturability?.. Yes I'm redoing it so the coolign channels are cleanable. This probably means leaving the bottom part of the open and then welding a ring in place to close it after makig sure its clear... hope to finishe that design and send it off tonight. Why don't you take what you've learned with the 4" tube and scale it up to 8" or so? That way you'd get the square cube law working for you rather than working against you--especially when you lose the weight of all the extra fittings and plumbing lines. For the size rockets you're considering, it seems to me the Otrag approach doesn't help because Otrag was comparing a simple tube vs. the complex tanks of much larger rockets--tanks which had many feet of welds, complex internal bracing, and so on. In your case, a 6 or 8" (or even 10 or 12") tube is no more complex than a 4" one, nor is it that much more costly--almost anyone who can wind you a 4" tube can probably wind you a 12" one for about the 4" price plus the cost of the additional materials. Certainly a 12" tube won't cost 12 times what a 4" tube would cost, which is what the ratio would have to be to make the Otrag approach viable (using your 1-6-12 rocket as a basis for comparison). So you're losing on mass and you're not gaining anything on cost--in fact, I'm pretty sure the clustered approach will end up costing *more*. When you factor in the additional complexity of the Otrag approach (have you figured out how to reliably air-start 6 motors simultaneously?) I think a single tank/single motor (per stage) is going to start looking very, very appealing. My own feeling is that you have to solve enough problems getting to orbit (like spinning up the third stage while aiming it where you want it and doing so within a very tight mass budget) that you don't need to encumber yourself with the non-essential complexity, mass, (and probably cost) of clustering. I might also point out that when you double the length of your tank to allow for pressurizing it, you're effectively cutting the density of your propellant by half (same mass, twice the volume)--thereby making it comparable to or slightly less than the density of nitrous. Not sure that's a win, either--may as well just use nitrous and omit the extra complexity of a separate pressurization scheme. All that aside, I'm not saying you can't make a clustered approach work; I'm sure given enough man hours, persistence, and dollars you can in fact do it. It's just that I don't see the point when a simpler, lighter, and cheaper solution exists. Sorry about the cold water. Air start is easy with a cat pack, just turn it on it runs. What CAD did you use to model the regent engine, and do you have some more images of the cooling channels? Are they equally space radially around the chamber? I've been evaluating CAD systems and I'm on the verge of buying solidworks as much as that is distasteful.